From stunning golf to thrilling safaris, with leisurely afternoons in award-winning vineyards and sunset cruises on shimmering lagoons, we promise a holiday like no other. Start with 5 very memorable nights at one of the best golf resorts in the world and certainly South Africa's #1, Fancourt and tee-off on two superb Gary Player designed championship courses. Next, drive along the famous Garden Route coast of the Indian Ocean to the tranquil surrounds of Arabella; just outside Hermanus on the Whale Coast. After a quick recharge break, it's off to Cape Town for a heady mix of incredible activities. A Cable Car ride to the top of Table Mountain to check out stunning 360° views of the city and the buzzing Waterfront below will be your most vivid memory from this trip. Pay your respects to Nelson Mandela at his erstwhile prison where you will be shown around by a former inmate including the infamous cell that housed 'Madiba'. The best, quite unsurprisingly, is saved for the last at the Kruger National Park for close encounters with the legendary Big Five and plenty of other game - both on and off the iconic Leopark Creek golf course. The itinerary below is a sample package. Please fill out the form at the bottom of this page to begin the process of creating your trip. At the heart of South Africa's Garden Route - an area known for its glittering white beaches, dramatic gorges and inland mountains, amidst 613 acres of lush countryside, sits the world famous Fancourt Golf Resort, with 3 onsite Gary Player designed courses that are all ranked Top 20 in the country. Since opening in the early 90's, both the Outeniqua and Montagu courses have matured to be among the best parklands in the world and enjoy international fan following. South Africa's #1 course, the Links is inspired by the Scottish fairways and is acknowledged by Gary Player as his design masterpiece to date. Rejuvenate at the world-class spa and fitness center featuring a sauna, steam room, heated Roman bath and Jacuzzi. Play a game of tennis at any of the four courts, enjoy a picnic at nearby beaches or simply stroll through the perfectly manicured grounds. Every step will swoon you over with classic elegance and impeccable servicing. Arrive at Johannesburg Airport and board a connecting flight to George. After arrival you will go to the Fancourt Golf Resort, at the heart of one of the most beautiful coastal stretches in the world - the Garden Route. Play at Outeniqua Golf Course, a deceptive parkland course with water hazards on as many as 11 holes, including 4 of the last 5. The subtle deceptive layout and fine conditioning gives a memorable playing experience for golfers of all skill levels, without being overpowering. Enjoy a leisurely breakfast and the gloriously landscaped grounds of Fancourt, that was once a family homestead of Henry Fancourt White. The Blanco Manor House has been painstakingly restored as an ultra-luxurious boutique hotel. Spend the day as you like it, perhaps exploring the state-of-the-art Golf Academy that is managed by PGA-TOUR professionals. Take a full-day excursion of the Garden Route starting with Monkeyland - the world's first free roaming multi-specie primate sanctuary and experience a spectacular blend of flying colors at Birds of Eden. Lunch and entrance fees are included. Follow up with a fairytale sunset cruise on Knsyna Lagoon, while you taste canapés and fresh oysters with sparkling wine. Return back to the harbor long after the stars appear in the sky. The Links Golf Course is currently ranked as the #1 golf course in South Africa and #34 in the world by Golf Digest US. With your caddie, explore this stunning walking only course held in high esteem all over the world. No wonder the legendary Black Knight considers the Links at Fancourt as his greatest design masterpiece. 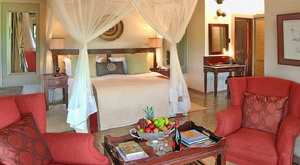 The multi-award winning resort is ideally located between the George Airport and the historic town of the same name. A proud member of the "Leading Hotels of the World", Fancourt is known for its personal and discrete hospitality. The luxury suites (54 mt. sq.) are set in picturesque villas overlooking the golfer's warm-up area, gardens or Outeniqua Mountains. All have private terraces, lounge areas and spacious en suite bathrooms. Subtle white-grey finishes evoke an old world charm while high speed internet and satellite TV keeps guests up to date. High tea at the Manor House, Italian fare at La Cantina, fine dining at Henry White's or health snacks at Morning Glory apart from the Club Lounge makes Fancourt a patron's delight. The Montagu Bar and Library enjoys a quieter, historical feel with wooden-shelved walls and a fireplace. Right at the entrance to the spectacular Garden Route, recently voted as the 6th best coastal drive in the world, lies the serene village of Hermanus. Well not so quiet between July and November when tourists from across the world flock to this whale-watching haven to witness the spectacular aerobics of giant Southern Right Whales as they migrate through the Cape's waters every year. Just outside this frenzy, on the Whale Coast in Cape Overberg lies Kleinmond. Reputed as home to the country's only herd of wild horses, it is perhaps best known for the Arabella Country Estate, with the 4th best golf course in South Africa. This Peter Matkovich designed parklands layout will charm you with its outstanding views, fast kikuyu fairways, dominant bent greens and really great finishing holes. And look out for the gentle giants of the ocean, meters from the shore, that may stop you mid-swing. Check out of Fancourt and depart for Mossel Bay and the stunning Pinnacle Point Golf Course. Perched high above the rocky Indian Ocean cliffs, the lush fynbos creates a sharp contrast with the ochre rocks and azure sea to create several postcard landscapes. Seven holes play across chasms to the greens that seem to be floating above the ocean! If the wind is blowing, make sure you have enough golf balls handy, as they are often lost in the steady ocean breeze. After your round of golf, continue down the Garden Route and check into the Arabella Golf Resort in the Overberg district. The Arabella Golf Course overlooks the Bot River Lagoon and features the best finishing holes on both of its nines. This long but friendly course will seduce you with its tricky sand traps, challenging water hazards and stunning views on every hole. To soothe those aching muscles after a long day on the course, try the onsite world-class Altira spa and a signature two-hour long African Rainforest therapy - that you won't find anywhere else on the continent. Located at the of heart the Kogelberg Biosphere Reserve, one of the richest plant kingdoms in the world, is the Arabella Hotel & Spa. It embodies the classic elegance of old world style, with its soaring wooden beams, warm interiors and a soothing aura that promotes tranquil living. 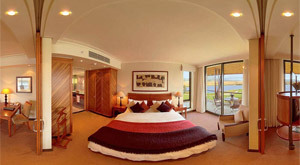 The guestrooms are decorated with rich rosewood furniture, luxurious cottons and plush duvets. Full-width sliding glass doors lead to a private terrace or balcony that overlooks pristine grounds, a swimming pool, mountain views or lagoon waters. Luxurious en suite bathrooms feature double basin sinks and elegant stand-up showers. The Jamani Restaurant serves authentic South African fare with an option to eat al fresco on the terrace while fine dining at the Premiere is a unique experience. Bars include the relaxed ambience of Laguna Lounge, Laughing Waters beside the swimming pool and the sophisticated Cristobal's Cigar Bar with a colonial feel. They say - “There's never a bad time to visit Cape Town!” and it has so much to offer everyone too. You can play on a championship golf course in the morning, get refreshed at a Constentia wine estate for lunch, take the cable railway to Cape Point in the afternoon and even meet the penguins at Boulders beach in the evening, before soaking in the heart of Cape Town with a glass of wine on the ever-buzzing Waterfront. However, few experiences are more thrilling than being whisked up on the iconic Table Mountain Cableway. It's a short ride that you won't want to end, as the cabins rotate for 360 degree views of the distant city. Down below lies the V&A Waterfront where entertainment venues, shopping arcades and gourmet cafes seamlessly merge with Cape Dutch architecture and 21st century skyscrapers. At a short distance sits the ancient 150 year old lighthouse of Cape Point, with awe inspiring panoramic vistas that your camera will simply love. 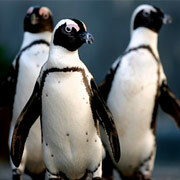 Check out after breakfast and embark on a full-day tour of the magnificent Cape Winelands. Spend the afternoon sampling classic wines at historic vineyards, including a visit to Ernie Els Wines for a private cellar tour and a walk through his trophy room. 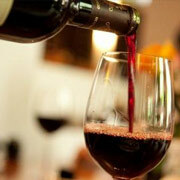 With your palate satisfied, a short transfer brings you to the V&A Waterfront to check in at the center of Cape Town. 18 holes golf on the Royal Cape Golf Course, South Africa's oldest golf course, this is the home to the annual Cape Town Open. It's a challenging parkland layout that will provide a stern test of golf for players of all abilities. Take a break from golf and enjoy the spectacular Mother City. Take a full-day excursion of the Cape Peninsula, and of course the iconic Table Mountain Cableway. Finally, meet the friendly Jackass penguins at Boulder beach and, time permitting, a lovely walk through the picturesque Kirstenbosch Gardens. After breakfast take the ferry to Robben Island Prison Museum (similar to Alcatraz) where Mandela spent a large part of his prison years.You will be guided by an ex-inmate and even get a glimpse of the infamous cell of Nelson Mandela. On conclusion of this inspiring tour, spend the day at exploring the city at your leisure. 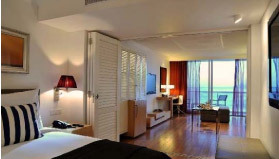 Superbly situated on the edge of the Atlantic Ocean, overlooking the Victoria & Alfred Waterfront with the Table Mountain in the background, the Radisson Blu Waterfront hotel offers the ultimate in comfort and luxury to travelers. The 75 m² luxuriously appointed rooms flaunt Scandinavian styling from overhanging balconies, which offer spectacular views of the private marina, Table Mountains or across the bay to Robben Island. A second en suite room includes a separate lounge, full kitchenette and spacious bathrooms endowed with luxury amenities complete the setting. Executive Chef Andrew Lee brings many years of his London experience to provide an inspired menu, paired with superb South African wines at the Tobago's Bar and Terrace Restaurant. The great location also ensures a wide array of culinary options in the area that is sure to satisfy anyone's palate. Sabi Sands Wildtuin, the "birthplace" of sustainable wilderness tourism in Sub-Saharan Africa, shares a 50 kilometer unfenced border with the neighboring Kruger National Park that allows animals to move freely between the two iconic wildlife havens. Intersected by the Sabi and Sand rivers, Sabi Sands offers some of the best wildlife viewing in Southern Africa, most notable being a large number of predatory big cats (lion and leopard) and an amazing diversity of plains game. Your stay will include guided safari drives in the morning and at dusk on open Land Rovers. These outings are well structured, and you will be kept up to date about recent sightings by highly trained teams of experienced rangers and local Shangnan trackers. Guided walks offer yet another perspective of that cannot be appreciated from the back of a 4WD Land Rover. Check out and head to Cape Town Airport for your flight to Nelspruit Airport. Here you will be met and transferred to the Jock Safari Lodge. After checking into your room, join the rest of the group for High-tea before your first game drive in search of the Big Five. Your ranger will have you up very early this morning with hot coffee and biscuits. Be ready for golf as the day begins with a transfer through the Kruger National Park to Leopard Creek Golf Course. Home to the Alfred Dunhil Golf Tournament each year, this course is a wonderful layout with numerous animals strolling the fairways. 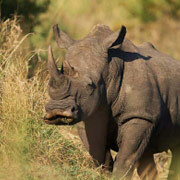 Return to the park in time for an evening game drive, or time permitting, a guided walk. 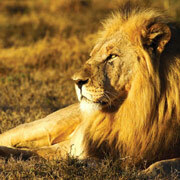 Between morning and evening game drives is a day of relaxation in the African brush. Gather around the campfire in the outdoor boma before dinner and exchanging anecdotes from the day's safari with the lion's roar in the distance. The Jock Safari Lodge rests at the confluence of the shimmering Mitomeni and Biyamiti Rivers, at the south-western portion of Kruger Park. The old world romance is reflected through interesting artifacts like historic wagons of a bygone era. Both the Main Jock as well Fitzpatrick's at Jock are elegantly decorated with thatched roof and reed walls, which combine with contemporary comforts. Besides private plunge pools, en-suite baths and outdoor showers, suites also boast a Sala or outdoor beds, which offer amazing river views. Climbing wooden stairs that wind through a 400 year old Jackalberry tree, leads on to the upstairs bar area with a viewing-deck that overlooks the rock pool and Biyamiti River. Pilgrim's Rest Spa provides the perfect therapeutic balm for the body and soul, while the head chef conjures authentic African flavors that is served indoors or in the outdoor Lapa under a star studded sky.